Rainbow Communications Loughgall Country Park Rally – Regulations and Online Entry Submission! Unfortunately we have to announce that this event has been cancelled due to an organisational difficulty that has arisen with the venue. Entry fee £40.00 per team of four people which includes the provision of snacks and the opportunity to win team prizes. 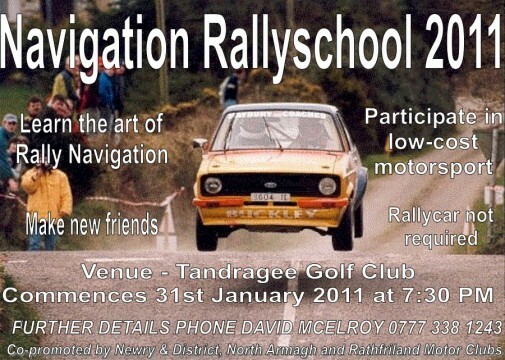 North Armagh Motor Club Ltd is hosting a retro film show, featuring a look back at early Club events, at 8pm on Friday 12 March 2010 at Tandragee Golf Club, Co. Armagh.